I like to serve bowls of steaming hot soups for meals, especially for dinners and on raining days. They warm up our tummies and nourish our bodies. Soups are not difficult to make but preparation takes some time. Now I make 2 to 4 frozen soup kits to store in the freezer. The basic idea is to pre-cut all the plant ingredients and freeze them in a portion you normally use for your soups. That way, you just grab a kit and dump them into the pot when you need them. They’ve proven to be a life-saver and soups made with these kits are still nutritious because freezing reduces nutrient loss. If you research on freezing plant ingredients, you’ll get a lot of advice to blanch them before freezing, because cooking stops growth enzymes in plant ingredients and enables you to keep them fresh for longer. I don’t blanch anything I put in my soup kits, because they’re used up within 2 weeks – this makes assembling them much faster and fuss free. – I don’t like the idea of them mixing together when they are raw. – I always blanch my meats before using them in soups, so they’re going to be handled separately anyway. 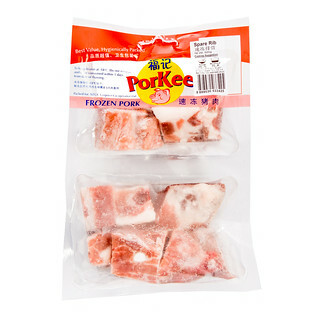 – I use spare ribs from this brand called Porkee and they are so well compartmented and packed, there is no reason to risk contamination either. 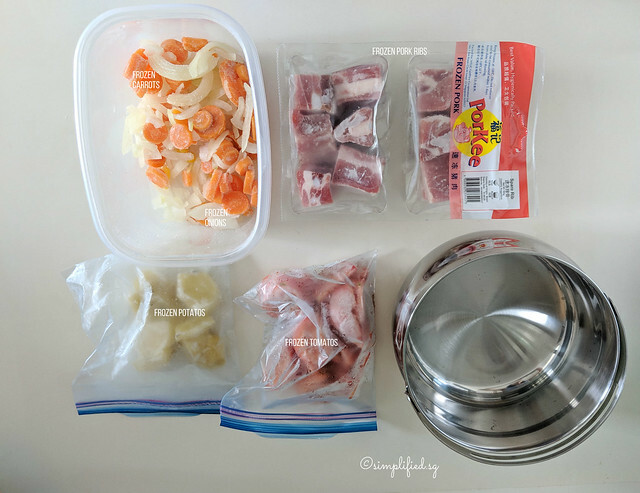 I used to make my own broth to freeze and use whenever, but now I tend to buy the premium chicken broth from Kee Song (Redmart / NTUC / Kee Song website) and use them in my soups. It’s a quick fix if I need to make soup on a short notice and – I’ve tried and tested, they’re good stuff. – easy to clean, so it removes the use and throw mindset in me as compared to using freezer bags. 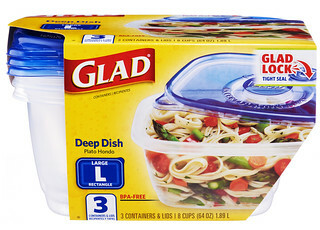 – space saving in storage because both the container and the lids are stackable. To illustrate how quick and convenient it is, I’ll show you what happened last week. It was raining and I wanted to serve something hot for dinner. I had a soup kit that was not completely emptied because there was too much to fit my pot, so I grabbed them, together with some frozen tomatoes and potatoes and made ABC soup without the corn. If I added macaroni, it could have been a complete meal. That simple! This post is part of a series of posts on this blog on simplifying cooking for home cooks, including kitchen planning. I write as I go along, so check back for more posts. I am very active on instagram stories, where I sometimes answer requests to solve day to day inconveniences – join me there if you like things like this! If you’re new to this site, please start here. To subscribe to future posts, please click here. You can also visit my previous site at Estella.Sg for more posts.